On Friday I stopped by the Hood Kitchen Space to check out some freshly made scones from scratch. 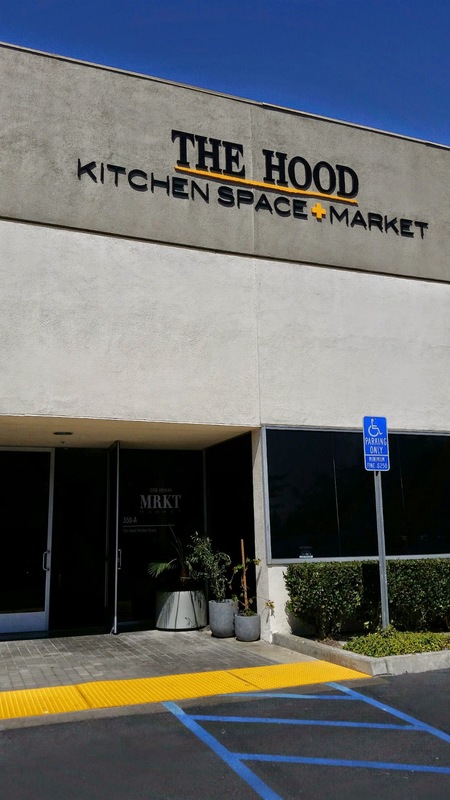 A week prior I had been invited to check out “The Original Stuft Scone” at the Hood Kitchen Space in Costa Mesa by Chef Jayne and her husband/business partner, Richard. :) Chef Jayne has been baking her scones for more than 20 years, so I was excited to see what these scones had to offer. 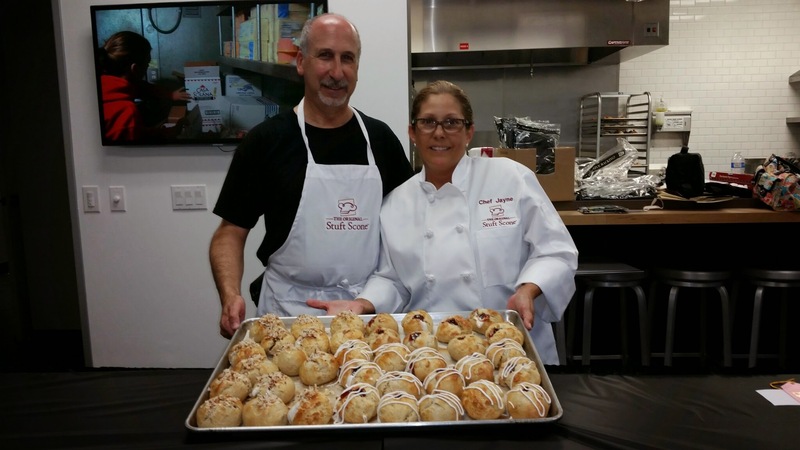 Chef Jayne and her husband Richard, started The Original Stuft Scone Inc. this year in 2014. 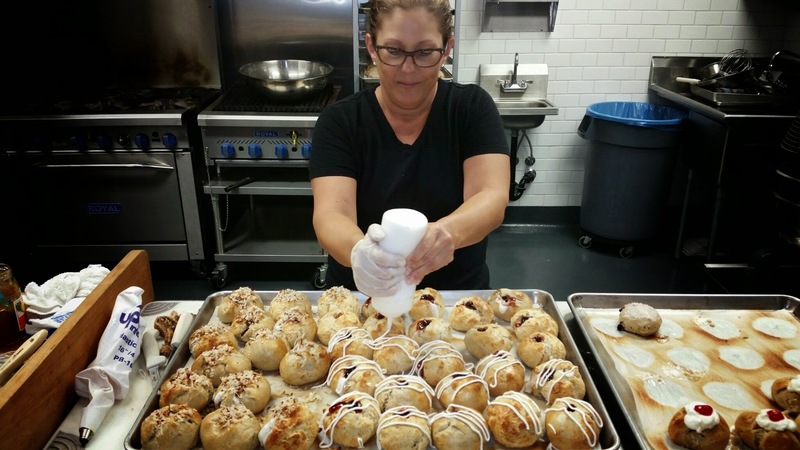 Jayne is using recipes that have been perfected over the past 20 years, and all of her scones are hand made in the 5,400 square foot commercial kitchen called The Hood in Costa Mesa, California. 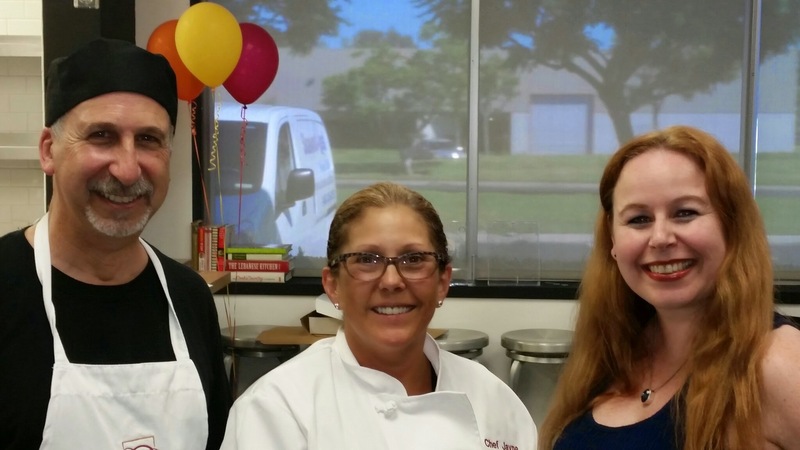 Chef Jayne graduated from the Orange Coast College Culinary Arts program in 2006 and she brings to us some amazing flavors of scones that are stuffed with a variety of different delicious fillings, both sweet and savory! 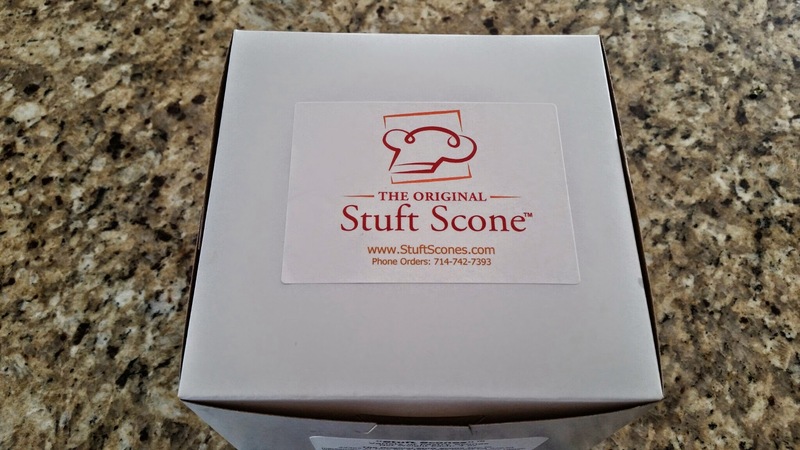 I brought home 3 varieties of scones to try at home from a variety of 9 different flavors currently available! All of the Jayne’s scones are uniquely named after different Orange County cities. In the future they plan to do seasonal varieties as well! Traditional scones (top 3 above) are $10 for 4 scones and all scones below are $12 for 4 scones. All orders must be placed before 2pm the day prior to assure proper delivery. 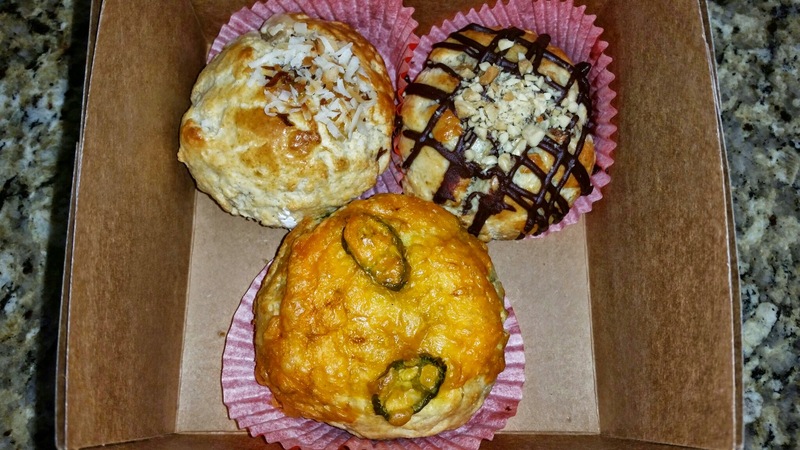 The three scones that I personally took home to try were the La Habra Peno – Cheddar & Jalapeno, the San Juan, stuffed with peanut butter and chocolate, and the Pacific Paradise (an OC Fair winner this year) stuffed with pineapple jam and covered with a coconut topping! I loved all three of these and each of them had completely different flavor profiles as you could imagine considering there were 2 sweet and one savory. The cheddar & jalapeno had a great amount of filling inside and overall this scone was the most satisfying of the three for us. I thoroughly enjoyed the filling of the pineapple jam and coconut topping, although in the future I would like to see a little more filling inside to spread throughout the scone….or maybe a small side of pineapple jam to add on top? 🙂 I also really loved the peanut Butter and chocolate scone; the only thing I did add to mine was some strawberry jam. I loved the peanut butter & jelly idea! 🙂 I love the idea of being able to order extra topping spreads, but that is just me…I foresee there being many fresh innovative ideas to come with these scones upon purchase. I never actually try a scone but you make it sound delicious. I love coming to your website, but you always tease me with such deliciousness haha. These look so good, wish I can taste them, just love a couple thousands if miles too far haha. mmm, I love coming to see all your goodies. But you make me so hungry with the deliciousness haha. I love scones, and I’m thinking cheddar and jalapeno will be a winner! Wow! This one seems to be everyone’s favorite! Thanks for the comment! My son want it all lol, The The jalapeno is just perfect for me. Those all sound so good! I love the three choices you made. I agree, that there should be an option to have a side of filling. 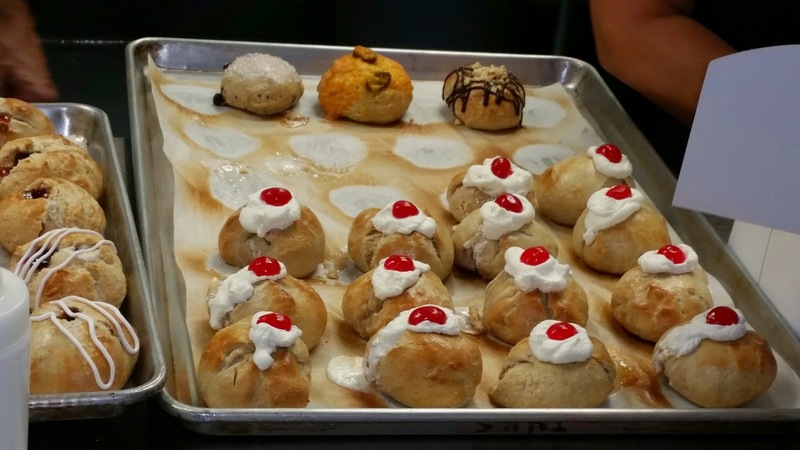 Scones are good, but these look even better…so unique! Thanks so much for the comment Deanna:) In the future I will have to try the others. :) Definitely sides of the filling would be awesome! These all sound wonderful. The cheddar and jalepeno is calling my name. Come on down! Let me know when! These scones are so delish!! Lots of great pastries on display. Nice. They were pretty delicious! Thanks for the comment!